Dr Ray Shaw’s rise through the ranks of US technological giant, Varian, began with a love of building scientific instruments as an undergraduate at Monash University. Dr Shaw started university in 1967, unaware of where the chemistry and physics he was studying would take him. It was an exciting time at Monash, he recalled, with the days of the Vietnam War and demonstrations on campus. After finishing his PhD in spectroscopy Dr Shaw stayed on as a senior teaching fellow – spending nearly a decade at the university altogether – before being offered a position as a senior scientist in the Melbourne arm of Varian, which manufactured scientific instruments. Within a few years of starting at Varian he was appointed the company’s research and technology manager, reporting to the general manager. Dr Shaw left Australia in his mid-30s to run a small company Varian had acquired in California. It was a “great experience” for him, completing the transition from being a technical manager to a business one. Two years later, in 1987, he was heading Varian’s Nuclear Magnetic Resonance division in Silicon Valley, a $200 million outfit recognised globally for its work developing magnetic resonance equipment, including pioneering work in MRI. Additionally, he was ultimately responsible for all of Varian’s worldwide facilities, information systems and activities in Asia and Latin America. Until recently he has chaired the board of Rectifier Technologies, and a small vineyard/wine company. 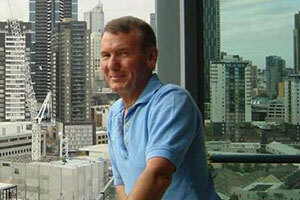 A keen sailor, he is involved in managing the sport in Victoria and regularly competes in ocean-going races.